The New York Giants have officially signed unrestricted free agent defensive end Josh Mauro (Arizona Cardinals). 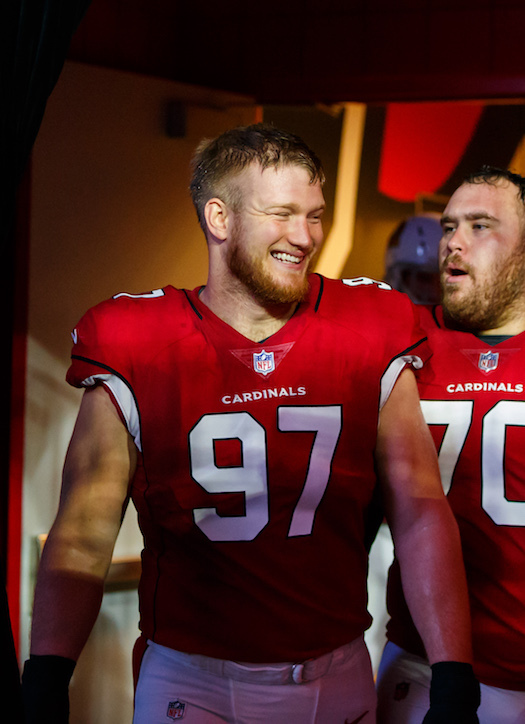 The 27-year old, 6’6”, 282-pound, English-born Mauro was originally signed as an undrafted rookie free agent by the Pittsburgh Steelers after the 2014 NFL Draft. He did not make the team, but was signed by the Cardinals after he was cut. The Cardinals cut him last week. In four seasons with the Cardinals, Mauro played in 47 regular-season games with 26 starts, 20 of which came in the last two years. In 2017, Mauro started seven games and finished the season with 22 tackles and one sack. Mauro is a hard-working run player who does not get much heat on the quarterback (only two career sacks). 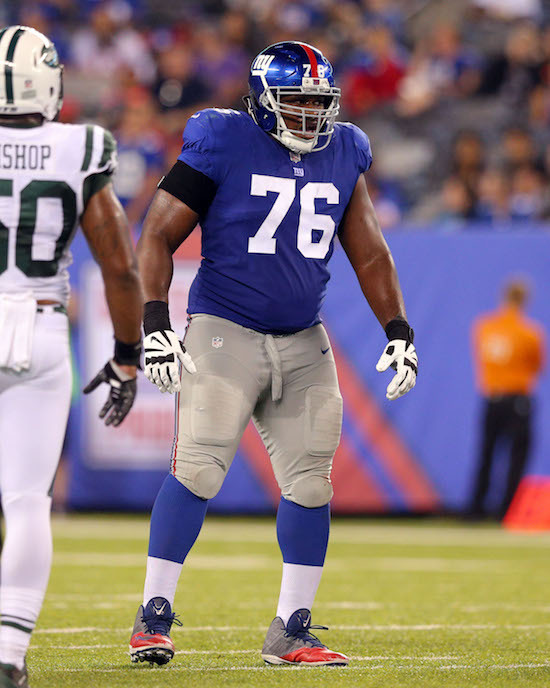 The Seattle Seahawks have signed New York Giants unrestricted free agent offensive guard D.J. Fluker, who was placed on Injured Reserve in late November 2017 with a toe injury. The Giants signed Fluker in March 2017 after he was cut by the Los Angeles Chargers. He started six games at right guard before being injured. Fluker was drafted by the San Diego Chargers in the 1st round of the 2013 NFL Draft. In four seasons with the Chargers, Fluker started 59 regular-season games, first at right tackle and then right guard. After a solid rookie season in 2013, Fluker struggled with the Chargers and was cut in March 2017. The NFL Network is reporting that the New York Giants intend to move cornerback Dominique Rodgers-Cromartie (DRC) to safety in order to compete with free safety Darian Thompson for the starting job opposite of fellow strong safety Landon Collins. In his fourth season with the Giants in 2017, Rodgers-Cromartie had a solid, but nondescript, season despite being suspended for one game by the Giants for multiple violations of team rules. DRC played in 15 games with five starts, finishing the season with 48 tackles, 0.5 sacks, and one pass defense. For just the second time in his 10 year career, he did not pick off a pass, and his pass defenses plummeted. Rodgers-Cromartie will be entering the final year of the 5-year, $35-million contract that he signed with the Giants in 2014. He is currently scheduled to count $8.5 million against the 2018 salary cap. Rodgers-Cromartie was originally drafted in the 1st round of the 2008 NFL Draft by the Arizona Cardinals. He was traded to the Philadelphia Eagles in 2011 and signed with the Broncos as an unrestricted free agent in 2013 and the Giants in 2014. The past two years, the Giants have played DRC more inside at slot corner. Rodgers-Cromartie made the Pro Bowl in 2009 and in 2015, the latter as an alternate. 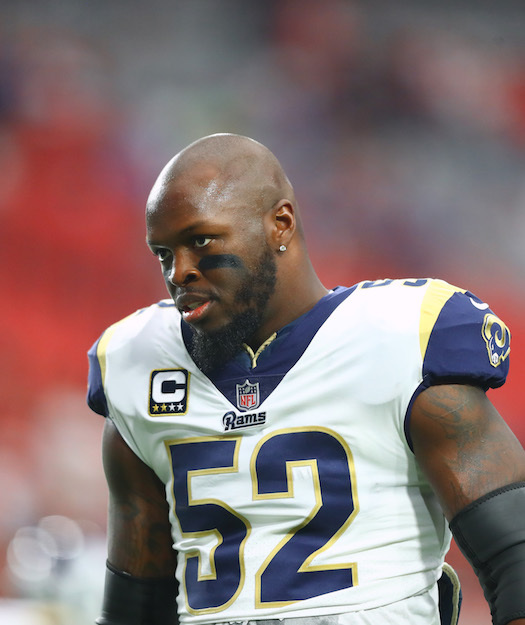 He was also named second-team All-Pro in 2016. While he has not missed many games, DRC seems to battle a lot of nagging injuries and has seen his playing time significantly reduced in recent years. The Daily News is reporting that an unidentified source says several teams are expressing “significant” interest in soon-to-be unrestricted free agent offensive guard D.J. Fluker of the New York Giants. Free agency begins on March 12th. Offensive lineman Justin Pugh (back), defensive tackle Damon Harrison (ankle), linebacker B.J. Goodson (ankle), and linebacker Kelvin Sheppard (groin) did not practice on Wednesday. Offensive guard D.J. 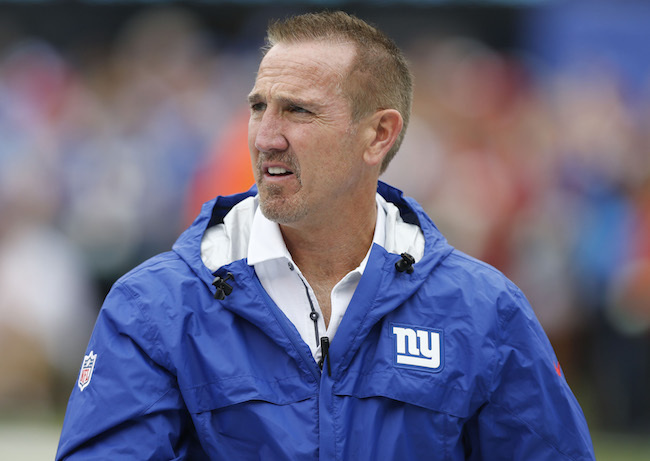 Fluker (knee), defensive end Jason Pierre-Paul (knee), defensive tackle Dalvin Tomlinson (ankle), Devon Kennard (quad), linebacker Calvin Munson (quad), and cornerback Donte Deayon (ankle) were limited in practice. The Giants practice on Thursday at 12:10PM. The team’s coordinators and select players will also address the media after practice. Joan H. Tisch, the widow of Preston Robert “Bob” Tisch, passed away on Thursday morning after a brief illness. She was 90 years old. Her husband bought a 50 percent share of the New York Giants in 1991. He passed away in November 2005. In Mrs. Tisch’s memory, the Giants will wear a decal with her initials (JHT) on their helmets this Sunday. For the remainder of the season, they will wear a jersey patch with her initials. Center Weston Richburg (concussion), offensive lineman Justin Pugh (back), defensive end Olivier Vernon (ankle), defensive end Kerry Wynn (knee), and linebacker B.J. Goodson (ankle) did not practice on Thursday. Linebacker Jonathan Casillas (neck), linebacker Calvin Munson (quad), and cornerback Donte Deayon (ankle) practiced on a limited basis. Running back Paul Perkins (ribs), wide receiver Sterling Shepard (ankle), defensive tackle Robert Thomas (calf), and safety Nat Berhe (calf) fully practiced. 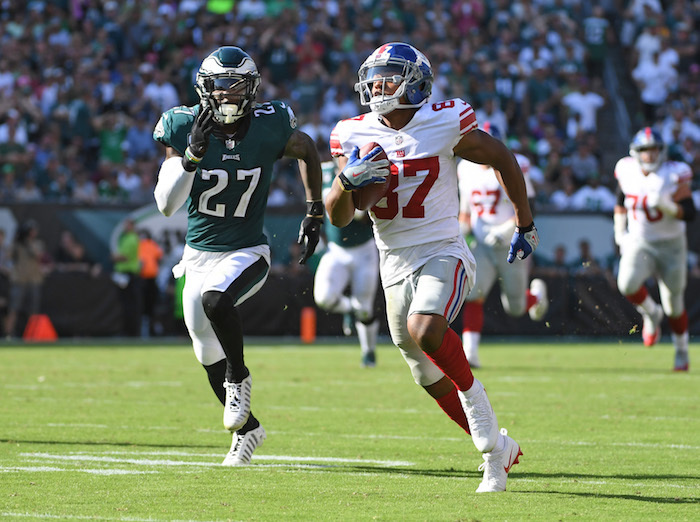 The New York Giants got back on the losing track on Sunday as they were defeated 24-7 by the Seattle Seahawks at MetLife Stadium in East Rutherford, New Jersey. With the loss, the Giants fell to 1-6 on the season. 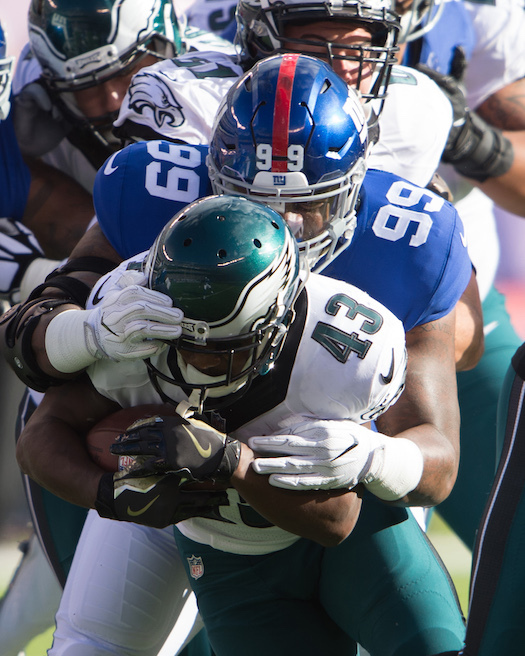 The Giants’ defense kept the game close until the 4th quarter. On the other hand, New York’s offense was beyond dreadful. The Giants were held to four first downs and 42 net yards in the first half and finished the game with just 14 first downs and 177 net yards (four first downs 49 yards of which came on late meaningless drive). More embarrassingly, six of the Giants’ 14 first downs were the result of penalties on the Seahawks; and the Giants did not have one rushing first down in the game. Despite these horrific numbers, the Giants led 7-3 at the half and only trailed 10-7 in the 4th quarter. Both teams punted the ball away to start the game after each offense picked up two first downs. The Seahawks then put together a 16-play, 85-yard, almost 9-minute marathon of a drive that ended on downs at the New York Giants 1-yard line when cornerback Eli Apple broke up a 4th-and-goal pass. 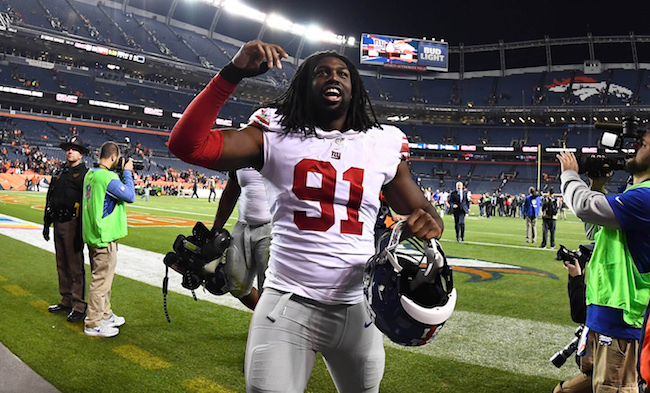 Although the Giants’ offense went three-and-out on the ensuing possession, New York immediately got the ball back when defensive end Avery Moss forced a fumble that safety Landon Collins recovered and returned 32 yards to the Seattle 17-yard line. Two plays later, quarterback Eli Manning found tight end Evan Engram for a 5-yard touchdown. The Giants actually led in this game 7-0. Seattle’s ran 11 plays that only netted 33 yards on their next possession and punted. The Giants went three-and-out for the second time and punted. The Seahawks then scored their only points of the first half after an 8-play, 49-yard possession set up a successful 39-yard field goal with 42 seconds before intermission. At the half, the Giants led 7-3 despite being out-gained 222 net yards to 42. New York’s first three drives of the second half resulted in a total of two first downs, 32 yards, and three punts. Meanwhile, although forced to punt twice, the Seahawks also took the lead on a 4-play, 59-yard drive that included three big pass plays and culminated with a 22-yard touchdown pass from quarterback Russell Wilson to wide receiver Doug Baldwin. 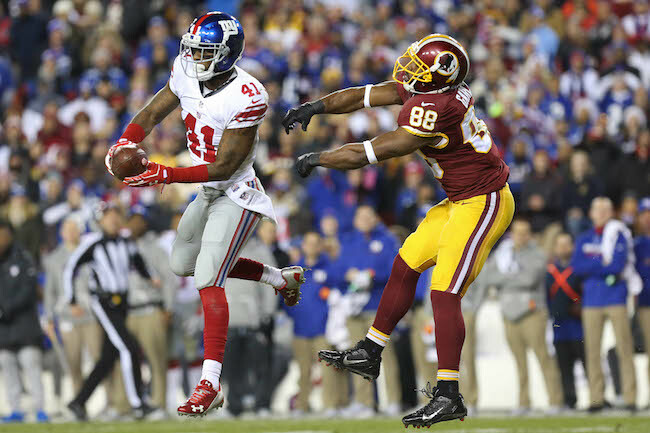 The Giants’ best drive of the game was a 10-play affair that only accrued a total of 57 yards and three first downs. Unfortunately, it resulted in a missed 47-yard field goal by Aldrick Rosas that could have tied the game early in the 4th quarter. The Giants’ defense forced another punt, and with 11 minutes left in the game, despite all of the offensive futility, the Giants still only trailed by a field goal 10-7. But on 2nd-and-5 from their own 41-yard line, Manning was sacked and he fumbled the ball away to Seattle at the Giants’ 38-yard line. On the very next snap, off of a trick play, Wilson threw a 38-yard touchdown pass to wide receiver Paul Richardson. The play was controversial as it was not clear if Richardson had possession of the ball as he was wrestling for it with Landon Collins. Seattle now led 17-7 with less than 10 minutes to play. The game was decided when the Giants went three-and-out on the ensuing possession and the Seahawks then generated a 12-play, 50-yard drive that ended with Russell Wilson’s third touchdown pass on 2nd-and-goal from the 1-yard line with 2:14 left to play. Manning finished the game 19-of-39 for 134 yards, one touchdown, and no interceptions. His leading receiver was Engram, who caught six of 12 passes thrown in his direction for 60 yards and a touchdown. Giants’ wide receiver caught a total of five passes for 45 yards. The Giants’ ground game was not good. Orleans Darkwa gained 35 yards on nine carries and Wayne Gallman chipped in with 15 yards on five carries. Defensively, the Giants only accrued one sack, by safety Nat Berhe. The only turnover generated was the fumble Moss forced and Collins recovered. Inactive for the game were running back Paul Perkins (ribs), wide receiver Sterling Shepard (ankle), center Weston Richburg (concussion), defensive end Olivier Vernon (ankle), linebacker Jonathan Casillas (neck), linebacker Calvin Munson (quad), and quarterback Davis Webb. Offensive lineman Justin Pugh (back), linebacker B.J. Goodson (ankle), and defensive end Cap Capi (hamstring) all left the game and did not return. The Giants are 0-3 in MetLife Stadium. Not counting the strike seasons, the Giants last lost their first three home games in 1980. The Giants have lost four consecutive games to Seattle, which has tied the all-time series, 9-9. 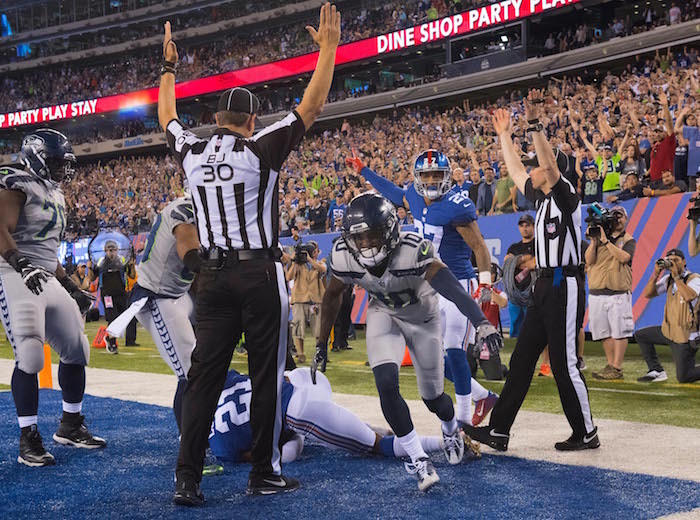 The Seahawks are 3-0 versus the Giants at MetLife Stadium. The Giants gained 177 yards on offense, their lowest total since they finished with 150 yards in a 38-0 loss at Carolina on September 22, 2013. 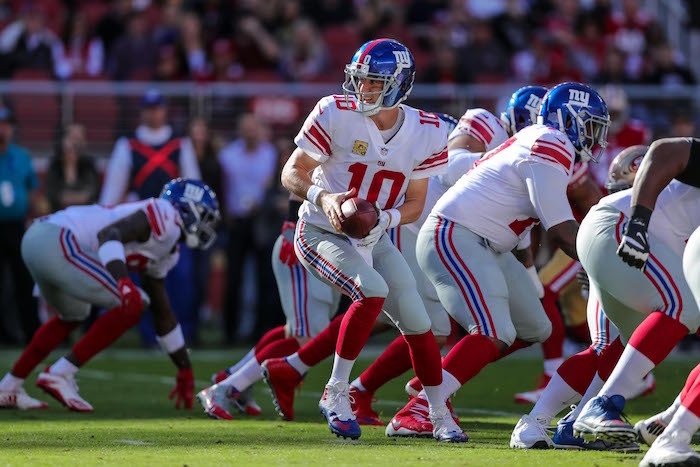 Quarterback Eli Manning played in his 208th regular-season game, breaking a tie with Howard Cross and moving into second place on the Giants’ career list. Hall of Famer Michael Strahan is the franchise’s record-holder with 216 games played. Manning started his 206th consecutive game.